This regulator includes a moisture filter and a pressure gauge. It has a 1/8 BSP inlet and a 1/4 BSP outlet, to which various adapters may be fitted. Please contact us if you would like our technician to help determine the adapters you need or fit the adapters for you. 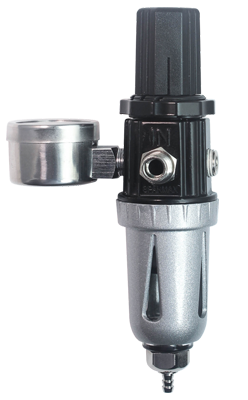 The regulator can be fitted to a compressor or a bench using a regulator bracket (sold separately). 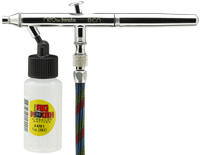 Or it can be joined to a Sparmax Airbrush Hanger with regulator bracket, which clamps to the edge of your bench or table.